Great Gardens is a half-hour gardening program that focuses on plants and all things related to successful gardening and beautiful landscapes in our area. In each episode, host Peter Mezitt will talk with staff at Weston Nurseries and other industry experts who will share their knowledge about plants and related horticultural topics. 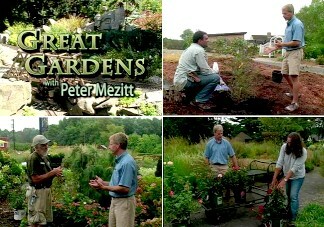 Viewers will learn from the experts on how to be successful in creating and maintaining fabulous home gardens and lawns. Topics range from design advice, planting techniques, pruning, plant health care, annuals, container plantings, seasonal touches, perennials, shrubs, trees, walls and walks, water features, and more.